This is the comprehensive guide for the operation and maintenance of large turbo-generators. 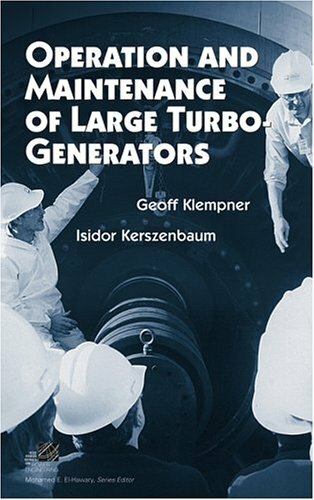 "Operation and Maintenance of Large Turbo-Generators" is the ultimate resource for operators and inspectors of large utility and industrial generating facilities who deal with multiple units of disparate size, origin, and vintage. It offers the complete scope of information regarding operation and maintenance of all types of turbine-driven generators built in the world. Based on the authors' combined sixty years of generating station and design work experience, the information presented in the book is designed to inform the reader about actual machine operational problems and failure modes that occur in generating stations and other types of facilities. Readers will find very detailed coverage of: design and construction of generators and auxiliary systems; generator operation, including interaction with the grid; monitoring, diagnostics, and protection of turbo-generators; inspection practices, including stator, rotor, and auxiliary systems; ideas for improving plant reliability and reducing costs and electrical failures; maintenance testing, including electrical and nondestructive examination. 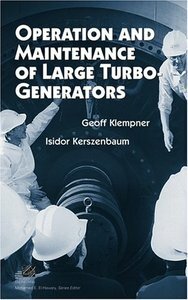 "Operation and Maintenance of Large Turbo-Generators" comes filled with photos and graphs, commonly used inspection forms, and extensive references for each topic. It is an indispensable resource for anyone involved in the design, construction, protection, operation, maintenance, and troubleshooting of large generators in generating stations and industrial power facilities. The book is also an excellent learning tool for students, consultants, and design engineers.